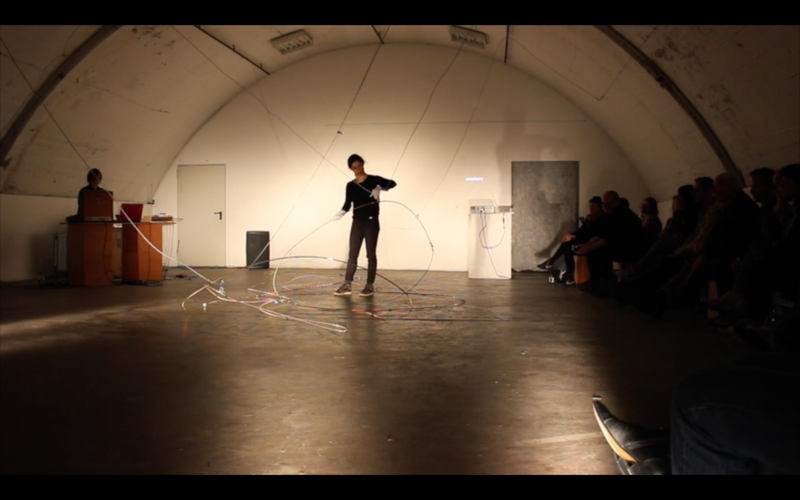 The project W I R E D, a performance first staged on 2 April 2016 in Rottstr5 Kunsthallen in Bochum, Germany, is a cooperation between me, Luísa Saraiva (choreographer and dancer) and Oxana Omelchuk (composer and musician). 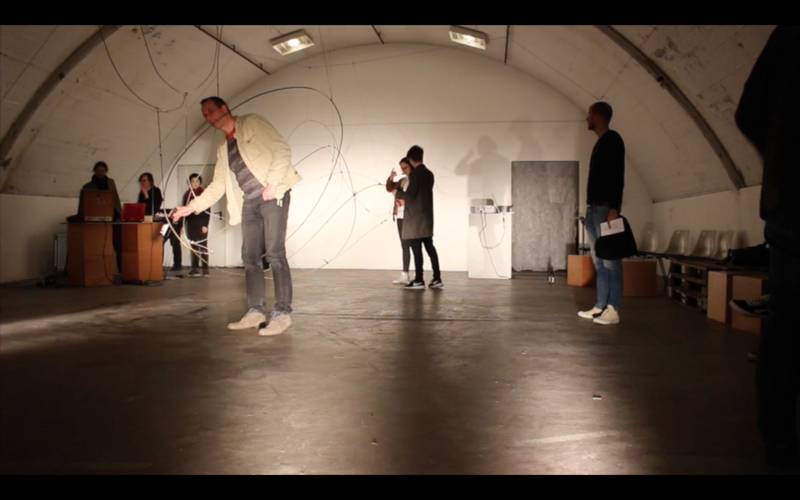 W I R E D works with creating spaces by means of visual work and movement. It involves the creation of a site-specific installation, designed out of metal bars and connection points. 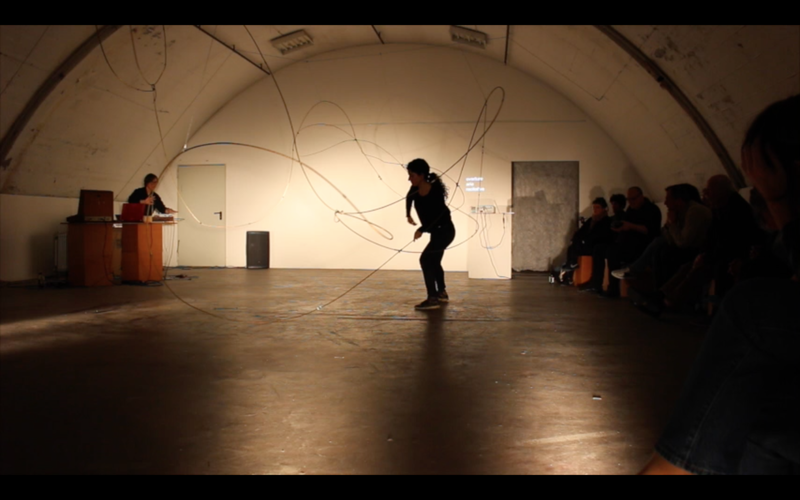 These materials allow for three-dimensional line drawings to emerge which interact with the use of the body as a material and form present in the space. We fill the room in a way that creates (or suggests) an alternative space, constantly redefined by the interaction between performer/object, audience/object, performer/audience. This will allow the audience to experience the given space differently, both on a physical and mental level. By working with organic, three-dimensional, large scale materials, we provoke a situation where the art-object cannot be avoided, and is necessary to physically engage with, in order to see it and experience it. Hence, the audience is in the performance space and is part of the performance, as by entering it, it is transforming it irremediably. Although W I R E D is designed for an inner-space, we are not so much working with the walls as borders that define the inner-space, but with the air between the walls. Questioning the notions of form and selfhood, we approach a new definition of space, as something present but invisible. You know it’s there, but it is in some way unfathomable. In this sense, it can be seen as a metaphor for the need to use form and shape as a way to generate meaning and function. As a praxis, we recreate this human tendency to make sense of the world in a more essential, abstract way. By working with performing bodies, we are also transporting these issues to the human body. Being that the notion of body itself already assumes some kind of form or border, we are interested in the formlessness that emerges when we switch the attention to the relationship (to other material or human bodies). Departing from the classical principle that the whole is more than the sum of its parts, we shift the focus from the form of the body or of the body performing a movement, to zoom into what lies in-between. In this sense, the metal bars become actors of a performed relationship with the space and are all part of the dance. The working principle is: The dance is the relationship that is the dance. That said, embodying the space is the goal in itself, challenging notions of form and allowing for new cartographies to emerge.